The average marriage in England & Wales will last for 30 years. The majority of marriages will end with the death of a spouse. Most online sources incorrectly report the average length of a marriage as 11-12 years. In a previous blog, we reported that the average (median) length of a marriage for divorces granted in 2016 was 12 years. We also noted that the estimated percentage of marriages ending in divorce is 42%. These figures were drawn from the UK Office for National Statistics 2016 release on divorce in the England & Wales. To calculate the average length of a marriage, we must combine the cumulative percentage of marriages ending in divorce with the cumulative percentage of marriages ending in death. By the 30th wedding anniversary, 40% of marriages will have been ended by divorce and 11% will have ended because of the death of a spouse. Therefore, 51% of marriages will have ended by their 30th anniversary. 60% of marriages are expected to survive to the 20th anniversary. 16% of marriages will reach the 60th wedding anniversary. These figures were last compiled in 2010. 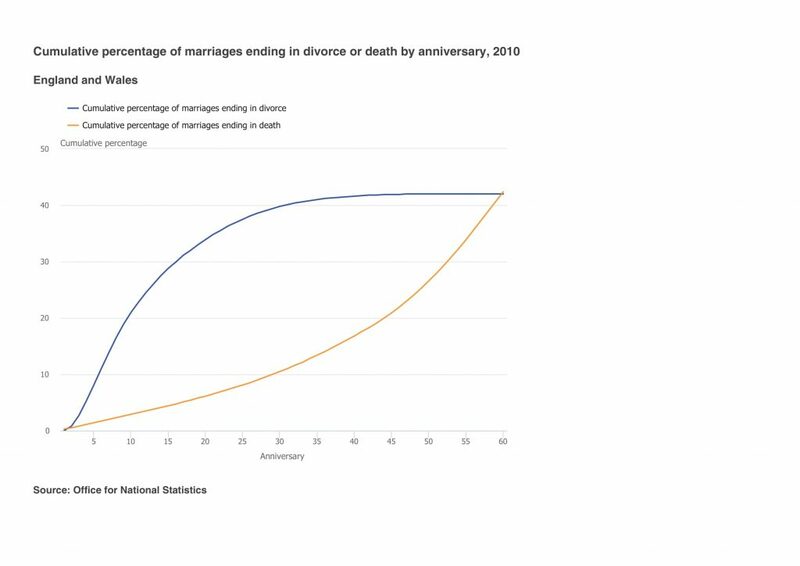 With record low divorce rates and increasing life expectancy, we should expect to see all marriages lasting longer in 2018. When Are Married Couples Most Likely to Get Divorced? ← Are Women More Likely Than Men to Instigate a Divorce?